I’ve been reading Osamu Tezuka manga the past few days; namely, a couple of the titles published by Digital Manga Publishing via one of their ever-present Kickstarters. Under the Air was the first; a seinen short story collection, it’s one of the better Tezuka books I’ve read in awhile. After finishing that, I started Melody of Iron, another anthology, but with a long title story (100+ pages) and few others, instead of many short tales. Though nowhere near the level that Vertical lavished on their Tezuka volumes, the localization and printing quality of these books is pretty good for DMP. However, after three backed Kickstarters, I may be done with buying new series from this company. For several years now, DMP has had a reputation for turning to crowdfunding whenever it wants to print—or reprint—just about anything. Not only has this been the case for niche titles, which is understandable, but also reprints of their biggest hits. One prime example is the BL drama Finder, which is so popular that new volumes would often hit the New York Times’ manga bestseller lists back when they had them. Perhaps this overreliance on crowdfunding was a reason why Finder‘s Japanese publisher terminated its contract with DMP. Many of their readers haven’t been too happy with them either; their books tend to get delayed and often have unreasonably low print runs, and their lack of communication on classic manga Kickstarters leaves much to be desired (on the other hand, a BL Kickstarter of theirs that I backed—mainly for reprint add-ons—had timely updates and great communication overall, though I don’t know how they’ve been since). On top of all that, they have practically no distribution—it’s hard to get many of their books even through a manga specialist like Right Stuf—and it seems like a fair number of their former employees didn’t like the place, either. Although a handful of Tezuka fans have damn near succumbed to Stockholm syndrome when it comes to DMP, I sort of hope that Tezuka Productions’ deal with them is the next one to be terminated. Anyway, back to the manga itself: as is customary for most all Tezuka printed in English these days, there is a disclaimer at the start of these anthologies that basically says that the depictions of various races in these works are products of their time, and that they should be seen as such. I would suggest to Tezuka Productions that they start mandating this sort of thing for gender depictions as well. Tezuka’s depictions of women are interesting at best but are more often problematic; Princess Knight and Message to Adolf have been some of the worst offenders for me, personally. The women in Melody of Iron (so far) and Under the Air are a bit more standard for Tezuka: not much more than love interests, wives, and/or relatives. 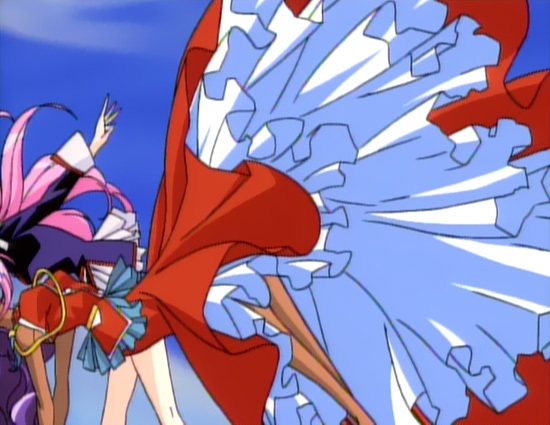 On a whole other end of the gender depiction spectrum, there’s the 1997 shoujo TV anime Revolutionary Girl Utena. This series, about a girl who was inspired to become a prince when she was younger, and the duels she finds herself embroiled in to win the hand of the “Rose Bride”, borrows heavily from both the magical girl genre and “girl prince” stories like The Rose of Versailles and the aforementioned Princess Knight to create something new. I talked bitprophet into watching the first dozen or so episodes with me—the Student Council Arc—and fortunately, he was intrigued enough that we ended up going through the whole show. This was my second full viewing of the series, so I was mostly interested in catching little details I had missed the first time around. Turns out that there were many: Anthy’s smiles, the consistent theme of animals in the humorous “Nanami episodes”, various spoken lines, even more props and objects. It remains a dense, character-driven series that requires a patient soul to fully deconstruct. This is a series where even its greatest weakness—its relentless reliance on reused animation, and indeed, entire scenes—ends up working in its favor. It’s glamorous while adhering to a certain routine, a routine which could be subverted at any moment. It’s the high drama and messiness of adolescence whirling around its simultaneously bland and eccentric title character in a series of duels accented by a primitive CG castle and hard rock choral music with strange lyrics. There’s nothing else quite like it, and I’m glad I watched it again. As for the other versions of the Utena story, a rewatch of the movie is being planned, and I’d already reread both manga series earlier in the year, thanks in part to a gorgeous new box set. And now, games! After beating Persona 5, I tried Wolfenstein: The New Order, but sadly found that it is not to my tastes, being a methodical shooter more in the vein of Call of Duty than the classic high-octane Wolfie I had been accustomed to. However, I found myself absorbed into Puzzle Quest, enchanted by Theatrhythm Final Fantasy: Curtain Call, and mildly amused by Mountain. I also played a pair of mediocre sequels in the forms of Elebits: The Adventures of Kai and Zero and Tales of Symphonia: Dawn of the New World, the latter of which was not nearly as bad as I’d been led to believe. There were also a few short Steam games—Quest of Dungeons and the two LostWinds adventures—which were okay. Then, there is the beautiful mess of Nier. 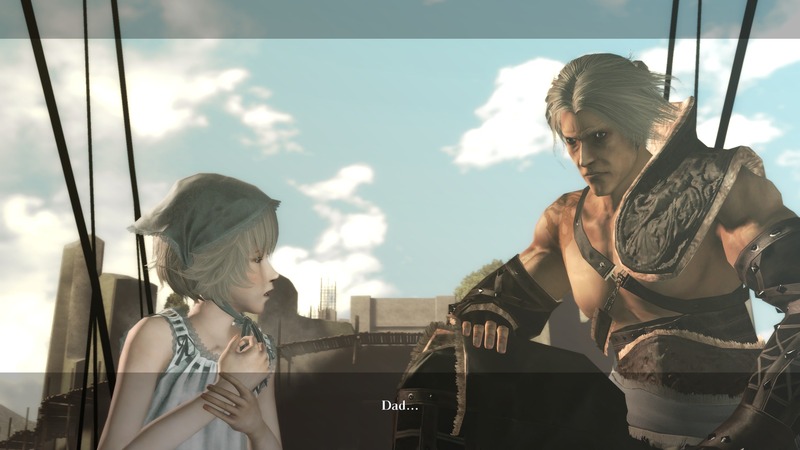 Nier is about a doting dad and his sickly daughter living in the far future of what is heavily implied to be our own world. It also stars a cynical magic talking book, a foul-mouthed huntress wearing the most ridiculous outfit in video games this side of Star Ocean: Integrity and Faithlessness, and a sweet and dangerous boy. It’s considered to be one of the best works to come out of the late cavia inc., a studio that was generally known for average-to-bad games with crazy plots. All the best parts of Nier involve spoilers (or, at the very least, things worth discovering for yourself), and I’ve only played the first ending so far, so I’ll just say that cavia doesn’t disappoint and I’m sure there’s a lot more to come. In addition to its entertaining storytelling, Nier has a striking visual aesthetic that strongly recalls ICO and other Fumito Ueda games, a soundtrack that absolutely deserves its stellar reputation, and some excellent voice acting. However, it also has some janky animations, alternately fun and annoying combat, meh sidequests, forgettable farming, and bad fishing. It is not a great game, but at the same time, it is. Nier is a weird, wonderful exemplar of gaming’s B-tier and I’m looking forward to getting the rest of the endings, even the one which erases your save and prevents you from playing it again (well, at least with that one account…). Aside from Nier, I’m currently playing NotGTAV, a crudely-drawn, humorous, and extremely British variant of Snake. I’m also playing my first Nintendo Switch game, Mario Kart 8 Deluxe. One of my greatest regrets in not ever getting a WiiU was missing out on Mario Kart 8, so I was delighted when this Switch port, which includes all the DLC, was first announced. It’s a damn good Mario Kart game, with an unbeatable spread of both new and old levels, including a great Bowser’s Castle, a pair of killer F-Zero-themed courses, and personal favorites such as Music Park and Grumble Volcano. My only real complaint so far is that the new Rainbow Road is somewhat underwhelming. It’s also still a little weird to see non-Mario-themed elements, like the characters Link and Isabelle (and those F-Zero tracks), in a Mario Kart. Otherwise, the little tweaks they’ve made are mostly great, and I’m having a good time. I’ve recently started the 150cc Grand Prix, after clearing 50 and 100cc, and will devote my attention to those courses whenever I’m not diving further into the craziness of Nier.